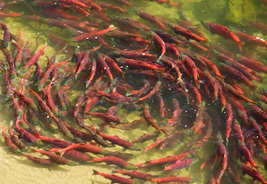 Wild salmon are one of nature's wildest and purest foods. Starting and ending their life cycle in the freshwater streams and rivers that braid the West Coast, wild Pacific salmon travel thousands of miles between the time they hatch and spawn. They are the lifeline of the Pacific Northwest, feeding entire ecosystems with their nutrient-rich bodies. You can feel good about choosing and eating wild salmon not only because it's delicious and packed full of healthy nutrients and Omega 3s, but also because the vast majority of wild salmon available in the marketplace is harvested sustainably and doesn't come with the environmental costs and concerns that farm-raised salmon do. Also, while it may seem counterintuitive at first, choosing and eating wild salmon is one way to help ensure that our salmon fisheries remain healthy and productive. How?...Your salmon dollars add value to our renewable wild salmon fisheries, and when something has value, people work to protect it. Salmon is big business and consumers wield a lot of power in the marketplace through their purchasing decisions. When you buy wild salmon, you are investing your dollars in our nation's sustainable wild salmon fisheries and are adding value to the freshwater habitat that wild salmon rely on during the most critical stages of their life cycle. If consumers were to stop buying wild salmon, then farm-raised salmon would quickly replace it. If that happens, then wild salmon conservation and management would no longer be a priority and we would lose the incentive to restore and protect freshwater salmon habitat. So vote with your fork and do your part to save wild salmon: eat one. 5. Join Trout Unlimited and get involved in your local TU chapter.